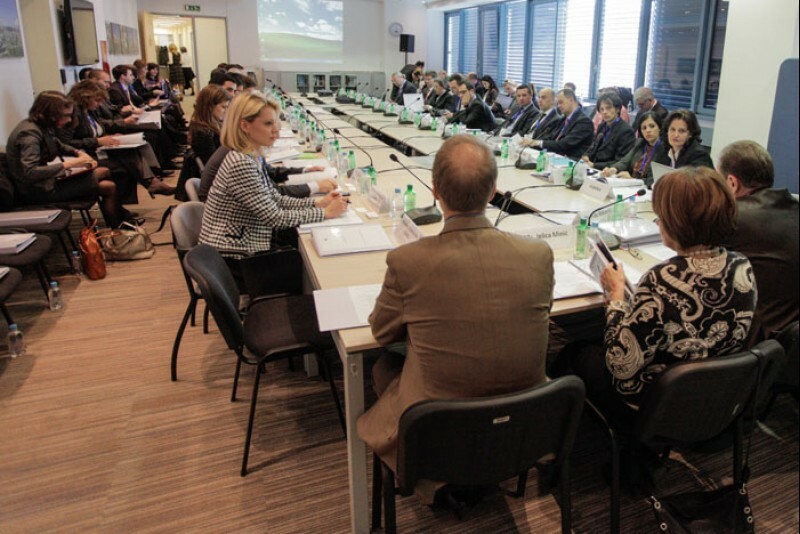 SARAJEVO, 18 March 2013 – Development of the South East Europe (SEE) 2020 regional growth strategy and its implementation will be the main topics of the 12th South East Europe Investment Committee (SEEIC) Meeting, which will be held in Sarajevo tomorrow. The SEE 2020 targets that the region needs to reach by 2020 include: regional GDP increase from 38% to 46% of EU average; total value of regional trade increase by 130%; and the trade deficit decrease from 14.1 to 11.6% of the regional GDP. The targets were adopted by the SEE ministers of economy in November 2012 to guide the strategy preparation. The SEE 2020 strategy is to be finalized by the end of 2013. The strategy is expected to provide for growth in trade and export rates; higher level of direct foreign investments; higher number of registered new businesses; increased employment with higher salary rates; and for an increase in the number of highly educated workforce. It also aims to improve public administration, strengthen the rule of law, and improve government efficiency. The event is co-organized by the government of Bosnia and Herzegovina and the Regional Cooperation Council (RCC) Secretariat, as co-chairs of the SEEIC. It will be held back-to-back with the CEFTA (Central European Free Trade Agreement) 2006 deputy ministerial meeting. The SEEIC and the CEFTA cooperate closely on SEE 2020 strategy aspects that aim to increase the intra-regional trade and inflow of foreign investments. Discussion on their forthcoming mutual activities in this area will also take place during the meeting. The 12th SEEIC meeting will bring together SEEIC participants, Western Balkans economic teams, representatives of the European Commission, regional partners and initiatives, international organizations, and the donor community. Journalists are invited to attend the opening of the meeting, on Tuesday, 19 March 2013, at 14.00, at the UNITIC building, Fra Anđela Zvizdovića 1, 71000 Sarajevo, Bosnia and Herzegovina. The SEEIC was established in 2007, based on the decision by participating members of the Organization for Economic Co-operation and Development and countries from South East Europe to create a high-level decision-making and coordination body to support the reform and implementation of policies promoting foreign and domestic investments in South East Europe. The Regional Cooperation Council (RCC) officially took over the responsibility over SEEIC activities in November 2011. Currently Co-Chaired by Bosnia and Herzegovina and the RCC Secretariat, the SEEIC comprises Albania, Bosnia and Herzegovina, Bulgaria, Croatia, Kosovo*, Moldova, Montenegro, Romania, Serbia and The Former Yugoslav Republic of Macedonia.